This giveaway is now closed, congrats to our winner Liliana! We have another super exciting giveaway for you today from The Raw Chocolate Co who are the company sponsoring this years MoFie prizes! Yup, you heard that right. MoFies are back and this year they have prizes! 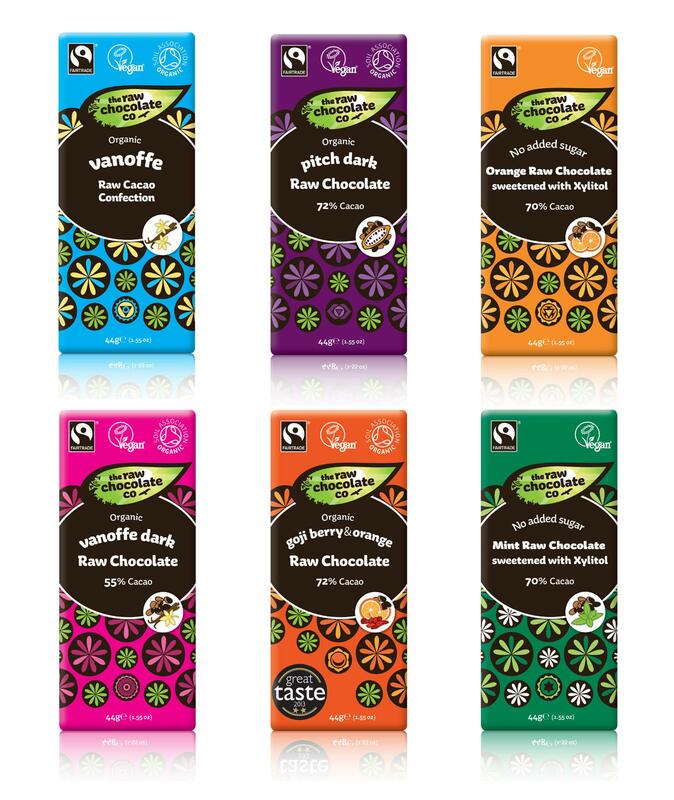 This super eco-friendly vegan company are offering you the chance to win six raw chocolate bars and three 100g packs of raw chocolate covered berries and they even ship internationally, hurrah! Flavours include Vanoffe, Vanoffe Dark, Mint and The Raw Chocolate Co’s award winning Goji and Orange bar. 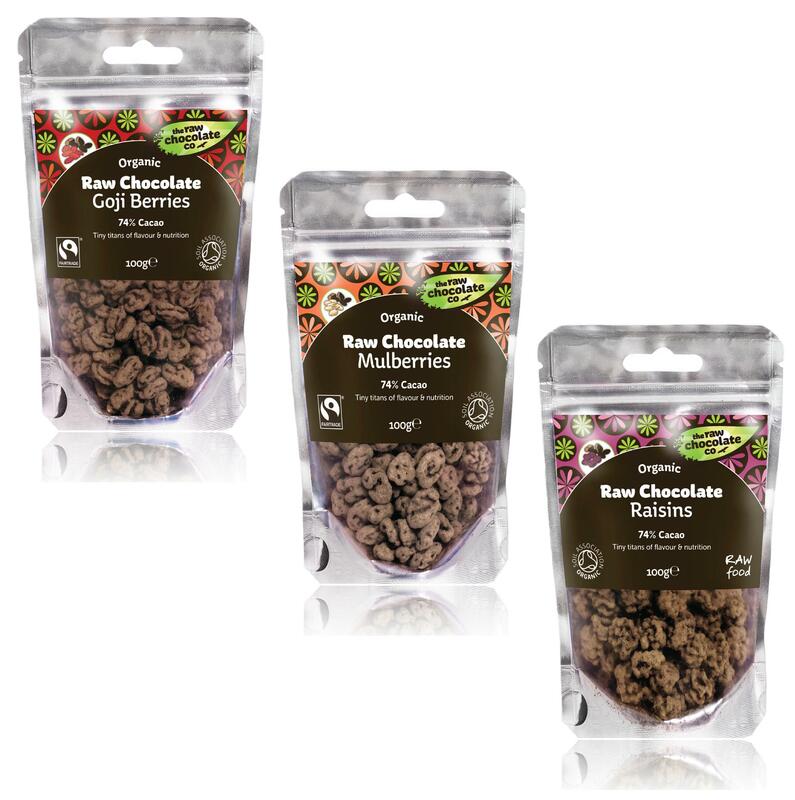 Another of their award winning products, the raw chocolate mulberries, are my favoruite product. I always buy the 100g bag which is great for sharing, they even come in a resealable bag so they make a great travel snack. To enter this fantastic giveaway just leave a comment below before 8pm GMT / 3pm EST tomorrow telling us which of the Raw Chocolate Co’s products you’re most excited about trying. Please be sure to leave a valid contact e-mail address so that we can contact you if you win. The winner will be randomly selected and announced after the giveaway has ended. This competition is open to everyone everywhere, yay! I would love to sample this! p.s. mint! mint sounds great! Ooh what a great giveaway! I always see these in health food shops but they’re a bit out of my budget range :p I’ve always thought the vanoffee bars sound gorgeous! All of them but especially those raw chocolate mulberries! mint … mulberries .. mint – tough choice but mint just gets it as the one to try! The vanilla bar sounds right up my alley! The goji and orange bar sounds super interesting. Oh my goodness! These all look amazing. The chocolate covered berries and the mint chocolate bar are seriously calling my name! Goji berry and orange sounds awesome, I like fruity chocolates. I haven’t seen these chocolate bars in Austria yet – curious to try them! My first pick would be the Vanoffe bar. Thanks for the Giveaway! They all sound wonderful, but I think I would have to go with the pitch dark. WHAT! I don’t even know what vanoffee is but I want it, And the raw berries would be amazing. Vanoffe would be first on my list, but I’d like to try all of the varieties. I’m a sucker for dark chocolate. A close second would be the chocolate covered Mulberries. Those chocolate mulberries sound incredible! Ooooh that Vanofee sounds mighty tasty. yay for international giveaways! Raw Chocolate raisins have to go to be the best afternoon snack ever!! Thanks for the giveaway. Mint Chocolate and the Mulberries sound the most exciting! Yum! I’d love to try mint chocolate bar and the goji berries! Yuuuuuum raw chocolate raisins! And the orange/goji…. delicious! Oh my! Chocolate covered mulberries?? Yes please! I would love to try Vanoffee Dark! The mulberries! Also, I tried the vanoffe once and loved it but haven’t seen it anywhere since, so it would be lovely to be reunited. Vanoffee! Especially the dark one. I’m a sucker for plain, simple dark chocolate. I’d love to try these! ???? I’ve never even heard of this brand before but all the products sound amazing. I’d especially like to try the chocolate covered berries, as that’s something I’ve never had vegan. oh my god, the chocolate covered goji berries sound & look soooo good. The mint chocolate bar sounds so good! But I would eat any of them, I looove chocolate. The orange bar; for sure! The mulberries sound interesting. I don’t think I’ve ever had mulberries. Yay.. Though I’m not sure I know what vanoffee is, it sounds great. I also love that the covered berries do look a lot like wormpoop. Oooh, I love mulberries! I bet those raw chocolate mulberries are amazing!! Vanoffe Dark! No question there. Sounds amazing! I think mulberries and dark chocolate sounds like heaven on earth! I’ve tried choco mint before and it’s my absolute favourite! Thanks for this giveaway !! Oh man, these all look awesome! Love that everything’s fair trade, too. I’d like to try the mulberries! I escpecially want to try the Chocolate Mulberries! Two of my favorite things together, yum! They would make a great snack on long hikes. I don’t know what vanoffee is, but it sounds amazing! Pitch Dark for sure! The darker, the better is how I take my chocolate!! Yum! The mulberries sound cool, never had one before! I think you’ve sold me on the raw chocolate mulberries, which I’ve never tried — I’ve never even tried mulberries at all! Normally, my answer would be the raisins, though. I’ve had a long-standing love affair with raisins in any form. When I was little, my parents would get me to do tricks for their relatives and bribe me with raisins. The raw chocolate covered mulberries, probably because I think that the choc would temper the sweetness of the berries rather nicely. ooh, I’m really interested in the mint chocolate bar that’s sweetened with xylitol. Although I love eating chocolate, I often have to refrain because if I buy a bar I want to eat the whole thing. And when it has a lot of sugar in it, well, I just avoid buying it in the first place! There’s a brand of chocolate at my local store that’s supposedly sweetened with natural no calorie sweeteners, but I was very upset to read the back and notice it had some non-vegan ingredients in it (luckily I read before I bought it!) I’d love to try one that’s actually vegan! It is a tie between vanoffe dark and orange raw chocolate. I want to try the orange chocolate! Definitely the choc covered mulberries. I don’t think I’ve ever had *a* mulberry, let alone a chocolate covered one! The goji berry and orange bar is what I would like to try! I think the raw chocolate mulberries sound divine. i want chocolate goji berries!!! Those all sound great, especially the chocolate covered goji berries. the mulberries! I’ve never had one! The vanoffe dark sounds great. Raw chocolate mulberries sound awesome! We used to go out mulberry picking when I was a child but I haven’t eaten one in years. I want to try the Raw Chocolate Mulberries! The Mint Raw Chocolate Bar looks really good! Mmm, goji berry and orange for sure! Yummm. I am most excited about the raw chocolate mulberries— so intriguing! The goji berry and orange is an unusual combination. I would love to try it ! Umm… the Orange Raw Chocolate definitely looks like it needs to get in my belly asap! Vanoffe Dark — I had to look at their website to see what the flavor meant– Vanilla-Toffee-Dark Chocolate… YUM! Raw chocolate mulberries sound amazing! The raw chocolate goji berries look delicious! Woah, those chocolate mulberries sound sick! I want to try their orange raw chocolate sounds super yum. Vanoffe Dark sounds the best to me! The vanoffe bar is gorgeous. I’d like to try the mint one though! Chocolate raisins are my favourites. Would love to see what these ones were like! I would like to try them all, but most interesting sounds the Goji Berry and Orange bar! I would love to try all of them,especially the orange chocolate. They all sound delicious but I’m really interested to try the mulberry and orange ones. Probably the mulberries, because I’ve never had one before! I’m most excited about the Raw Chocolate Goji Berries. I’ve had to look away as I type this, as the mere sight of raw chocolate mulberries is making me drool all over my keyboard. I just hope I haven’t made any spelling mistak*%es. The vanoffee white.. May have to buy some anyway, it sounds amazing! Raw Chocolate Mulberries sound wonderful! I love me some mint chocolate, so that one jumped out at me most! Thanks very much! You made my day!